Looking for a way to record Skype calls into a hardware recorder I came across this post by Dave Jackson. In his video he talks about the ability to record a call to his Zoom H4 recorder. He uses a mixer; therefore, I had to adapt his instructions to work without a mixer since I opted to leave mine at home for this trip. While his setup gives more flexibility on sound volumes, mine seems to work perfectly fine. If my setup doesn’t quite give you perfect volumes you can adjust each track separately in your sound editing program (as long as you aren’t over driving the inputs). This will record each side of the phone call into separate audio tracks so you can make easy adjustments later. 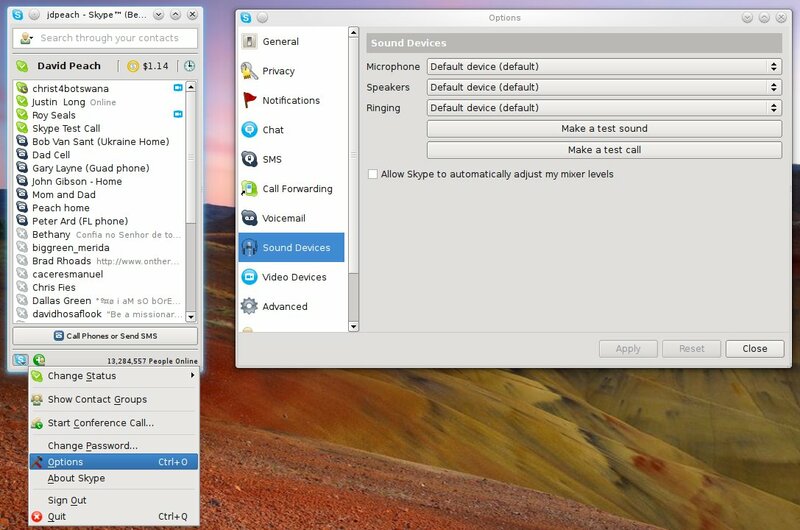 I have been recording my Skype calls in Linux using a python script called Skype Call Recorder (there are other recorders for Windows and Mac). Skype Call Recorder has worked mostly well, but occasionally it does not record my half of the conversation. Because of that I have (almost) always recorded my side into a separate recorder as a precaution. Except that one time…and therefore I have half of an interview with a missionary. That is, his half, but none of mine. I can probably go back and recreate my half of the recording, but I have never had the energy to do so. I can record my half of the conversation by plugging my studio mic into the H4, then use my USB headset to talk into Skype. However, to get both sides of the conversation I had to do a little thinking. It is the same as Dave describes in his post except I do not have a mixer to adjust my audio going to Skype. This also means I will have a cable or two going into different places. To adjust my sounds without a mixer I can use my volume settings on the computer or within Skype. 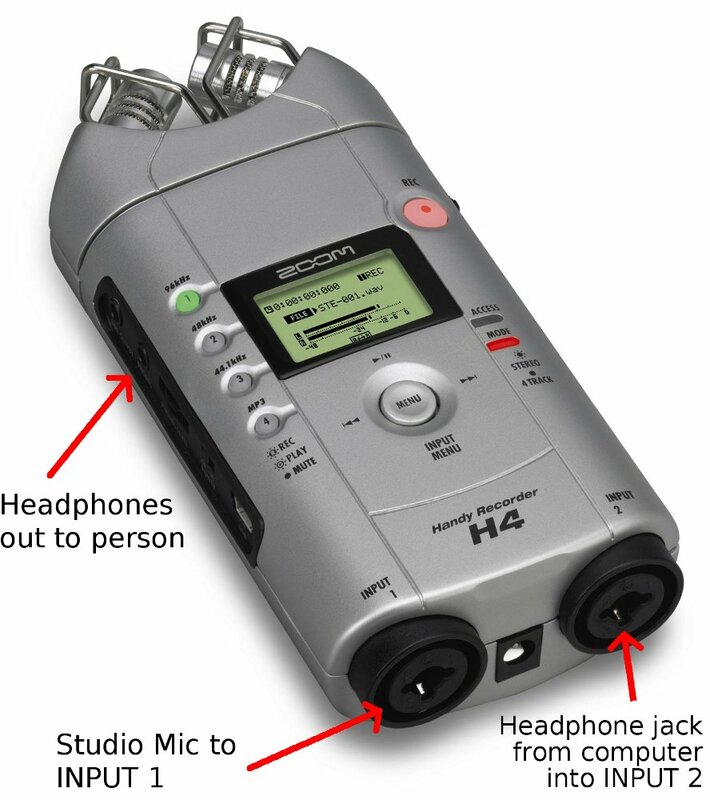 To get both sides of the conversation into the Zoom H4 you need to set the recorder to Stereo Mode and use the INPUT 1/INPUT 2 on the H4 (not the input called MIC in the menus). If you use 4-Track mode it will pick up all your room noise with the built in mics along with the phone call. I need to use 2 mics to make the call. The first mic is my studio mic and it goes to the recorder into INPUT 1. The mic I use to send sound through Skype is a USB mic which goes to the computer. My USB mic is part of a USB headset. You could do this with a stand alone USB mic since you won’t be using the headphones from the USB headset, only the mic. At this point you have a mic recording into the H4 and a mic going to a USB port on the computer. You now need to run the sound from the computer to the H4. I used a stereo 1/8″ to mono 1/4″ cable. I plugged the 1/8″ end of the cable into the headphone jack of the computer. The 1/4″ end goes into the INPUT 2 on the H4. This now gives you sound out of the computer and into the H4. You have both sides of the conversation going into the H4. The only thing left is to get sound out of the H4 so that you can hear what the person you are talking to is saying. Simply plug headphones into the PHONES jack of the H4. I used earbuds so that I could have those in my ears and still allow me to wear my USB headset like normal. All the sound will be coming from the H4. You are now hearing exactly what the H4 is recording, that is, both sides of the conversation. If you don’t hear both sides, then you are not recording both sides. There are a couple of changes in the Skype settings you need to make. If you are using a USB mic to speak into Skype, you will need to set that properly in your Options | Sound Devices section of Skype. These are Linux instructions, but I am sure you have similar settings in Windows). Microphone will be the USB mic. Speakers must be the computer’s headphone jack. I hope the explanation and pictures help you get better interview recordings. You may be able to adjust these settings for other recorders. However I am not aware of any others that give you 2 mic inputs so that you can do this same setup. Special thanks to my friend Jeff for letting me use his Zoom H4 when needed. He is just trying to make it that much harder to leave Argentina when our work here is done. Computer running Skype. I have a notebook computer with only mic in and headphone out jacks. If you have other jacks on your machine you would have other possible options. Zoom H4. I am using the original H4, but these instructions should work fine for the H4n. USB headset. Use the mic to talk to Skype. Headphones are not used. Therefore you could use a stand alone USB mic. Studio mic. To talk to the H4. Headphones from PHONES plug on the H4 to ears. From studio mic to Zoom INPUT 1. I used a standard XLR cable, but you can go from XLR (on the mic) to 1/4″ at the recorder. From headphone out on the computer to Zoom INPUT 2. I used an 1/8″ stereo to 1/4″ mono cable. Note: I know many podcast coaches try to steer people away from USB mics. We are using the USB mic to talk with Skype, it is not what is actually being recorded. The studio mic is what is being recorded by the H4. No, I don’t have any recommendations. If it were out of warranty and it was my device, I would have to open it up and just have a look around to see if anything was obviously disconnected or exploded in there. I would look for cold solder connections or a capacitor that looks overly cooked. Then I would probably end up putting it back together and seeing if I could get a real repair person to look at it. Previous Previous post: Are my problems behind me?